The best price found by our customers for Ibiza to Formentera recently is £46, with Aquabus Ferry Boats. Book an Ibiza to Formentera ferry today with AFerry. Just use the form above and choose the route that you want. If nothing appears automatically, start typing Ibiza. You can also type the country or even the name of the ferry company you are interested in. When you have the route that you want, choose single or return and all the other options you want. If there is more than one ferry company operating on the Ibiza Formentera route we will show you all the ferry companies, to make sure you get our best price. 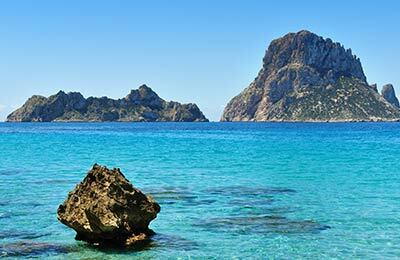 We'll also show you any routes similar to Ibiza to Formentera so you have the complete picture when making your booking. And of course you'll also see a range of times just in case it's a bit cheaper earlier or later than your preferred booking time. Once you've chosen your perfect sailing and have made your booking we'll email you your booking confirmation for your Ibiza to Formentera ferry. The majority of tickets have instant confirmation. Below you can see the ferry company or companies that sail on the Ibiza to Formentera route and the journey times. You might also see some recent prices our customers have found. The best way to find a cheap Ibiza to Formentera ferry though is to use the form above today to see all of our possible choices. With AFerry we always give you our best prices for ferries from Ibiza to Formentera. No matter which page you book from we always include all our special offers. And there is no need to look for a discount code. If we have an offer available, your ferry price will include the reduction or offer. There's no need to look at other websites. If you're not sure if the Ibiza to Formentera route is right for you or you can't decide between ferry companies, if there is more than one, you might also find it useful to read any reviews we have available. We ask all our customers to send us reviews for Ibiza to Formentera ferries. Remember though, that the earlier you book, the cheaper prices normally are. So don't spend too long deciding! Ibiza to Formentera is a popular route, so we advise you to book as soon as possible. Formentera Ferry port lies in Formentera, the smallest and the southern most of the Balearic Islands. It has a size of 84 square kilometres. Formentera is only reachable by sea because it has been impossible to build an airport due its characteristics. Ferries from Formentera go to Denia and Ibiza and can be booked through AFerry. Formentera offers a range of restaurants, pubs and discos open all through the year till in the night You can simply relax on the beaches or explore the inland with varied and breathtaking landscapes in Formentera. Formentera is approximately 19 Kms to the south of Ibiza in the Mediterranean Sea. The island is almost entirely flat, except for two promontories, one on each end: Cap de Barbaria with the mountain Puig Guillem (109 metres) and Mola with its Talaiassa (192 metres), the highest point of the island. On the northern part of the island there are two salt-water ponds: s'Estany Pudent and s'Estany des Peix. Formentera's main charm is its natural environment and most importantly, the pristine white sandy beaches with transparent waters. 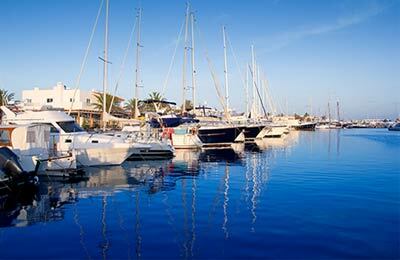 The marina in Formentera offers activities such as wind surfing, scuba diving and various other water sports.